Singing Bridge Performing Arts Lodge in West Cummington MA continues presenting the Singing Bridge Sundays concert series through each summer at 21 West Main Street in West Cummington. 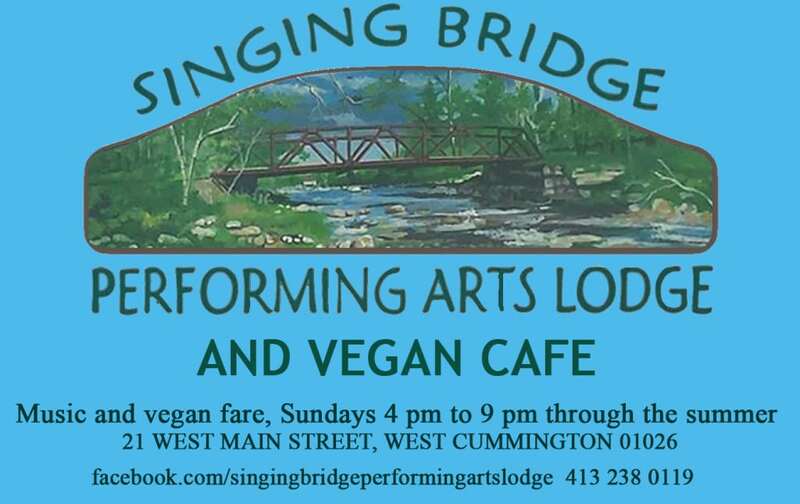 Singing Bridge features the best local musicians doing what they do best in a beautiful performance setting as well as amazing vegan pizza and more from The Singing Bridge Vegan Cafe. Singing Bridge Sundays are already becoming a great draw in the area, a favorite venue for taking in a show in an unusually relaxed setting and enjoying some truly special vegan fare. Singing Bridge Sundays will feature a different act every Sunday from 7 pm to 9 pm, with an opening set from house band The Gaea Star Band featuring various special guests. Visit us at Singing Bridge Performing Arts Lodge on Facebook or call us at 413 238 0119 for more info.